Administrators on Sociabble can now use audience targeting to filter content that one aggregates from LinkedIn and Facebook company pages according to language and location. This means that for company pages containing content in more than one language, or targeted at users in multiple locations, the same targeting criteria can be used to filter posts onto the relevant Sociabble channels. For example, a community manager whose company LinkedIn page contains posts targeted at US and South American audiences may post content in both English and Spanish. On Sociabble, they can use the same audience targeting to filter English content onto US channels and Spanish content onto South American channels. 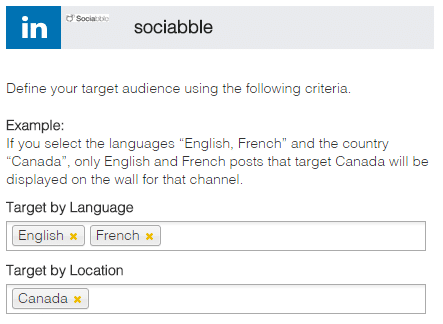 Sociabble gives administrators the option of filtering LinkedIn and Facebook content according to language and/or location. So if all company content is in English but targeted at users in different countries; administrators can use audience targeting to filter posts onto channels according to those locations. Audience targeting on Sociabble presents many benefits. With more and more companies looking to launch employee advocacy on a global scale; being able to filter posts makes it easy for all employees to access the content that is relevant for them. Moreover, having control over which content appears on which channels is highly important; as it enables companies to diffuse messages not only at the right time, but among the right audiences.